The town at the centre of an outbreak of the deadly Ebola virus in Congo has been sealed off to stop the disease spreading, health officials say. Nine people have died in the north-western town of Etoumbi, near forests where there have been at least three Ebola outbreaks in recent years. World Health Organization Congo director Amadou Yada said food would be delivered to the town on Friday. 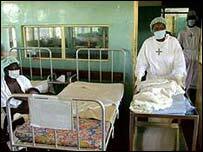 There is no known cure for the Ebola haemorrhagic fever. "The head of the district has placed Etoumbi in quarantine. Nothing goes in or out of the locality anymore," Dr Yada said. He said that no more cases had been reported in recent days. "I hope this epidemic will be the shortest we have known in Cuvette West, simply because the local people have taken precautions since the very beginning," he said. The outbreak began when villagers went to the forest to hunt elephants and came across the body of a dead chimpanzee, which they took home to eat, before becoming sick, officials say. The BBC's Christian Tsoumou in the Congo capital, Brazzaville, says that most people in the forest area are hunters and bushmeat is seen as a delicacy. He says that after previous Ebola outbreaks in the area, the authorities have told people not to touch dead animals they find but few people take any notice. Ebola is highly contagious and is spread through body fluids, such as blood and sweat. In 2003, 120 people died from Ebola in Cuvette West.